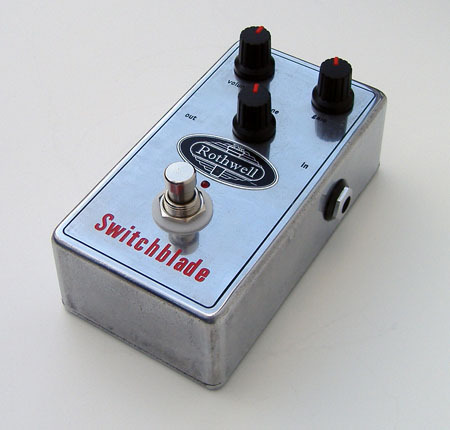 The Switchblade is a heavy/modern rock distortion pedal featuring three stages of distortion with carefully designed filtering before, between and after each stage to sculpt the sound and control the way each stage adds to the distortion. The bottom end of the spectrum is full and weighty with enough definition for every note of a chord to play its part. The top end cuts through without ever becoming fizzy and the midrange is slightly scooped to give a great tone for rhythm playing. However, there is a wide range of gain on offer and the lower gain end of the spectrum is great for less extreme music styles. The available output is also high so that even with the gain turned down low enough to be almost clean there is still enough volume available for the pedal to act as a booster. This means the Switchblade can be used to add distortion to your sound (anything from mild to fully saturated), boost your level, or a combination of the two. This is all achieved in a compact pedal with very low background noise levels, low battery drain, and true bypass switching. The circuitry uses a unique blend of distortion devices and is assembled by hand using top quality components and chassis mounted knobs and sockets (as opposed to circuit board mounted) for the ultimate in long term reliability. As with all Rothwell pedals the design is original (we don’t do clones or repros) and is derived by a painstaking process of careful calculation, computer aided simulation, trial and error and ultimately rigorous appraisal by professional guitarists. Heavy rock rhythm tone. This was recorded using a small class A valve amp (1 x ECC83 and 1 x EL84) with 10 inch Celestion speaker. The amp was pretty much clean with the Switchblade providing the rock tone. The Switchblade (£139) is available from our guitar dealers around the world (see full list) or from the online shop.